Note: One of the words at the center of this article in Thai is “มนุษย์ป้า,” which literally translated would be “the aunty human,” or “the aunty creature,” but which is here translated simply as “aunty.” The collective plural of “aunty” is “gang of aunties,” or in Thai, “แก๊งค์ป้า.” A longstanding force in public as well as private life, women who fall into the category of aunties have emerged as a critical category of political figures. This special report, originally published in Thai here , illustrates why this is not accidental and how aunties have come to be part of the vanguard against the coup launched by the National Council for Peace and Order.—trans. During the period of the past two weeks, “aunties,” or older women, have been a not insignificant component of the broad picture of opposition to the coup. At least 6 women have been arrested for making a three-finger salute against the coup or holding up signs opposing the coup. Among this group of six, at least four were age between at least 50 years old and up to more than 70 years old. The first two aunties to be arrested became widely-known because their pictures were on the front page of every newspaper. 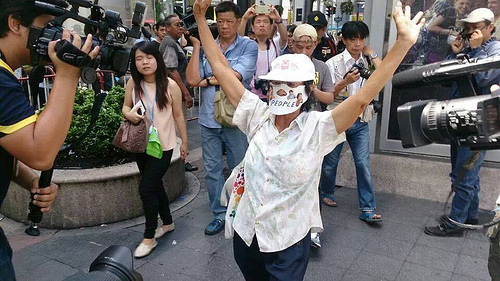 Aunty Lek, age 50, carried a sign that said “No Fascist,” and Aunty Yu, age 71, carried a sign that said “Prayuth Get Out.” Another to be arrested was Aunty Wari, age 71, whose sole message was the word “people” on a mask that she created and embellished herself. 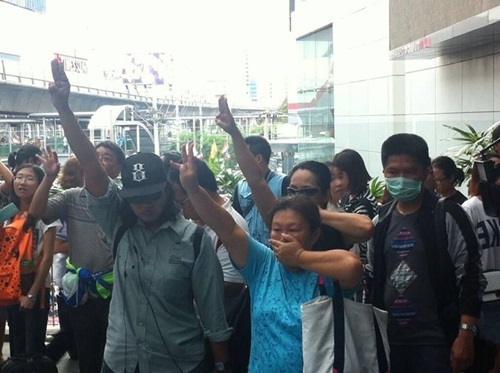 Finally, Aunty Nid, who is over 50, was arrested because she raised three fingers in the air along with others in front of Terminal 21 shopping mall. What all of these aunties share in common is that they do not have any responsibilities at home. Many are single women whose only duty is to look after their nieces and nephews. The majority often devote their free time during the day to keep up with politics. They feel injustice profoundly. And, as befits aunties, they are not afraid of powerful people. All of the aunties who were arrested by the military authorities were first taken to the police station to make a record of the arrest. Then, they were taken to be interrogated by soldiers in army camps in unknown locations. After that, they were taken to be detained at the Crime Suppression Division for 2-3 nights. But Aunty Lek was held there longer than the others — for 5 nights. Perhaps this is becomes she spoke frankly and her organization seemed frightening [to the authorities]. “They asked who hired me. I explained my thinking to them. I explained why I did not agree with the coup. I was unwavering. There is no one who could force me to change my opinion. I told them, you destroyed all of the rules. You brought guns to terrorize [the people] and called it reconciliation. People who think differently from you are not Thai? Where would you have us go in society? We have been hurt from many different kinds of injustice for a long time …,” Aunty Lek said through the bars. A gang of aunties who had taken taxis staggered in and crowded the area outside the bars behind which Aunty Lek was detained. Some of them may have already crossed the boundary between being an aunty and being a grandmother. The gang of aunties explained Aunty Lek’s biography. She nearly finished her degree at Ramkhamhaeng University. But her mother became gravely ill and so she left university to take care of her. After that, she became the pillar of the family and looked after her parents and nieces and nephews. She remained in this role until both her parents died and her nieces and nephews grew into young adults. “I see the truth of life. This is because I have taken care of one generation that was dying out and another generation that was sprouting up,” Aunty Lek smiled with pride at her role. The gang of aunties further explained that Aunty Lek was among the youngest of them. She takes care of those who are older than her, because she has all-around knowledge. Whatever it is that someone needs, Aunty Lek volunteers to do it. Whether it is to deposit money, open a bank account or do this or that transaction or errand, she is the one who does it. Therefore, it is not strange that the entire gang of aunties has come to visit her. Many shed tears and worried about their friend who sat dejectedly behind bars. After this, we learned that Aunty Lek and Aunty Yu were the trusted vanguard pair of the gang of aunties. The other aunties had restrictions arising from health or family. This all-around pair went right in and acted and also reported what happened to all of the members of the gang waiting to listen at home. “These two, they really go right to the heart of it. During May 2010, they were in Wat Pathum until the final night when there was shooting.” Another aunty explained that whenever there were demonstrations, Aunty Lek would take in extra work, such as ironing, in order to obtain car fare to go to the protests. When we asked Aunty Lek about her interest in politics, she explained had been somewhat interested before, but became really and truly compelled by politics after the 2006 coup. She was impressed with the policies of the Thai Rak Thai party. Even though she herself did not derive any benefit from the policies, she saw that those who were badly off could depend on them. Aunty Yu was the first to be released. The news from the gang of aunties was that her nieces and nephews were very upset with her and very concerned about the effects. They sent her to practice dharma at a temple immediately after she came out from behind the bars. Aunty Nid came in later. She is ethnically Chinese, always enthusiastic, and speaks very well. She explained her utter frustration and said that she was at her wit’s end. The thing that caused the most dread for her was not being detained, but was no longer being able to protest after being released. “I don’t know if I can stay at home. I am serious, really serious. I feel like I am suffocating and am very anxious and restless. I will definitely not be able to bear it … why must they go this far? All we did was express our feelings, our thoughts. We did not do anything wrong. We did not do anything violent. When I get out, I do not know how I will be able to stay at home. They [soldiers] say that if they see me again, I will be in real trouble,” Aunty Nid said. At this point, all of the aunties have been released. But their telephones have not been returned. Each aunty had to sign her name and promise that she would not join any political demonstrations. Many people detained before the aunties met with the same fate. As long as they did not have a case pending against them, they would be released after they were detained in the Crime Suppression Division for 3 days, 5 days, or 7 days depending on the situation. They all have had to sign their names accepting the conditions of release noted above, and soldiers call to follow-up after their release. 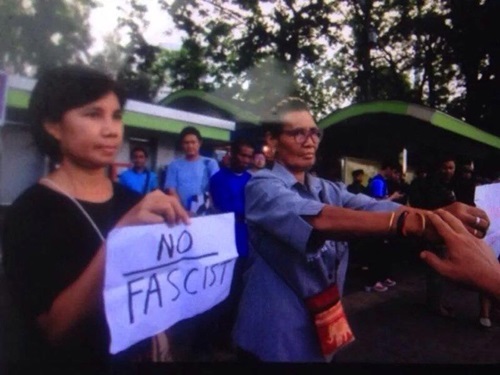 What is fascinating is that all of the aunties told us that they expressed their opposition to the coup frankly, even when they were being interrogated by the soldiers. One aunty explained that the first soldier who interrogated her was so angry with her that he got up and left the room. A second soldier came in to prevail upon her until she realized that resisting would not help anything and would likely cause her to be detained for a long time. In the end, she accepted the explanation of the soldiers that the coup was necessary in order to stop the loss of life of citizens on both sides.